COUPLES looking for that romantic dining experience this Valentine’s Day may want to consider Samplings On The Fourteenth, a year-old restaurant located on, no prizes for guessing, the 14th floor of the Berjaya Times Square Hotel in Jalan Imbi, Kuala Lumpur. Recently, we were offered the opportunity to preview Samplings’ menu for Valentine’s Day. With the spectacular night view of Kuala Lumpur as a backdrop, Samplings offers a perfect venue for that special Valentine’s date, matched by its menu offerings. Courting couples start off with Smoked Duck and Scallop. According to chef Valmurugan Subramaniam, the duck is locally sourced and cured in-house, before being put in Samplings’ smoke chamber for over an hour to develop its salty-smoky flavour. Similarly, the scallop was perfectly done and put over a bed of buttons, wild enoki, chanterelle and king mushrooms. Interestingly, the balsamic vinegar and lamb’s lettuce leaves provide a tangy counterpoint and it was fun to soak a little balsamico with the duck meat and enjoy the play of flavours in the mouth. For the soup, it is a seafood dish containing slices of Alaska king crabmeat, sea bass, scallop, clam and salmon. The light soup is flavoured with fish stock and more importantly, saffron, fennel and tomato. After the initial appetiser, and with the main dishes yet to come, the broth-like soup is perfect in terms of proportion. The decision to serve something light, rather than a cream soup such as pumpkin or mushroom, is well made in light of the following main courses. Sweet treat: The ‘Strawberry Delight’consists of homemade double chocolate ice-cream, sandwiched between a heart-shaped almond macaroon, with strawberry slices, and a side of blackberry and strawberry.The rose petals on the right are made from red fondant. After a palate cleanser of pink grapefruit sorbet, fortified with Campari, it’s on to the main courses. Samplings’ Valentine’s Day menu offers two main dishes for the romantic couple, with either Grilled Beef Tenderloin or Pan-fried Cod Fish Fillet in perfect proportions. For the “meat and potatoes” lovers, the beef option sampled was cooked to medium/medium-well perfection. Topped off with a slice of French goose foie gras, the taste is further enhanced with a reduction of dry port wine with shallots and rosemary, and accompanied by a rosemary skewer of spring vegetables and potato rösti. The fish option, consists of a 140gm cod fillet fried and topped off with a generous helping of Japanese sea urchin flesh. The accompanying caviar sauce, according to Valmurugan, is made from dry Chablis (a white wine), cream, shallots and chopped chives with a dab of butter and trout roe sprinkled in after the mixture has been simmered for colour and added taste. The dish is also accompanied by spring vegetables on a rosemary skewer. The dessert, named “Strawberry Delight” is a visual feast for the Valentine couple. Cleverly-shaped fondant rose petals adorn one side of the platter. 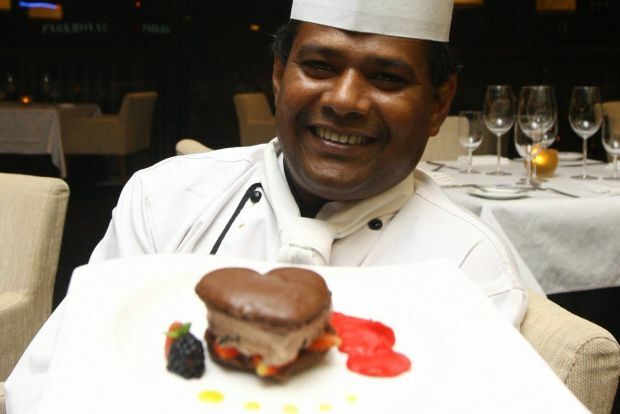 Meanwhile, home-made double chocolate ice-cream, sandwiched in a giant heart-shaped almond macaroon, should send any female diner’s heart aflutter. And that’s before you bite into the dessert itself. 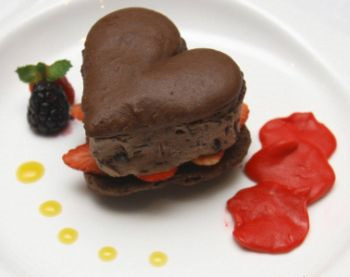 Cleverly inserted into the ice cream are several smaller heart-shaped strawberry slices to counterpoint the chocolate flavour. For the dinner entertainment, Samplings is apparently taking a break from the usual romantic guitar and lounge singer accompaniment. Samplings would be having local comedians Andrew Netto and Rizal Van Geyzel, as well as Australian Greg Sullivan on at 8.30pm on Valentine’s Day to entertain guests with their stand-up routines. 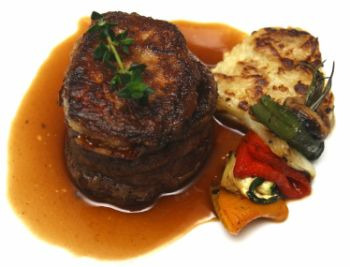 Juicy offering: The Grilled Beef Tenderloin cooked medium to medium-well, topped with goose foiegras and covered in a dryport wine reduction. The dinner is priced at RM158++ per person, with a complimentary glass of Carlsberg beer. Which, in this writer’s opinion, for the proportions and ingredients involved, seems a pretty good way of taking a date on a great night out without burning too big a hole in his (or her) pocket.